Call to schedule a FREE TRIAL Class in any gym program! For just $249.00 per nine-week Session, you can come to all available gym classes for your childs age, a great value for families who can't get enough Rolly Pollies! Hurry, though, we only offer a limited number of unlimited passes. 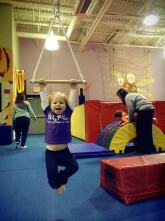 10% off your 2nd child's enrollment when registering your children for the same 9 week session. 10% off total classes for 3 or more siblings registering for the same session. May not be combined with any other offers. Twins? Triplets? Siblings that are enrolled together in our multi-age classes receive a SPECIAL discount! Your second child, enrolled in the same gym class, is only $100.00! (A $71.00 savings) May not be combined with any other offers.